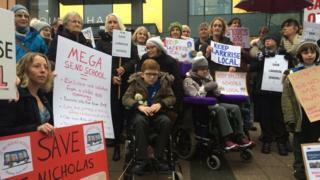 Plans to shut three special needs schools and replace them with a new £20m school have been put on hold. The move by Wiltshire Council follows months of criticism and campaigning by parents and MPs. The council will reconsider its options before making a final decision in the summer, also taking into account families' feedback. Parents were due to take the authority to the high court on the grounds its consultation process was flawed. The council said it would extend its consultation to ensure all views were heard. Campaigner Melissa Loveday, whose son goes to St Nicholas School in Chippenham, has welcomed the decision. She said: "There were fundamental flaws in the consultation process but hopefully they've listened to our concerns - so we're hoping to work with them from here on out. "It's lovely to hear that they want to invest £20m but we think it would be wiser to invest it locally and improve our current schools." The council's corporate director for children and education Terence Herbert said: "Schools in the north of the county are full and there will need to be an additional 220 spaces by 2023. "We want to work with families and staff to find a solution that both meets the need for additional places, improves outcomes for children and young people with special needs and disabilities who are educated in our mainstream, as well as special schools." South West Wiltshire MP Conservative Andrew Murrison tweeted it was great news. He wrote: "I'm so pleased the council has been listening. Let's hope there'll now be a thorough rethink on how to use the very welcome funding announced by Wiltshire Council to achieve the best result possible for vulnerable young people."